Catherine’s Family Kitchen landed in my own kitchen at a rather busy time. What with painting the newly renovated cottage, moving into it and the arrival of the Small Girl, this review got a little delayed. There are plenty of warming soups for wintery weather, quick suppers for cold evenings and tempting deserts for miserable nights. The Red Lentil, Red Pepper and Coconut Soup is full of sunshine, Lemon Pasta with Crème Fraîche and Rocket a speedy assemble job and Creamy Nectarine and Blackberry Pots are a lot less naughty than they sound. I love the five quick, simple ideas at the start of each chapter – eg salad dressings, sweet scones, sweet sauces (White Chocolate and Wasabi!) – and the five ways with mash is guaranteed to make you look twice at that sack of spuds. This book is all about getting a bit more imaginative when it comes to feeding the family, without scaring them off entirely. Lots of great meal ideas to try out. 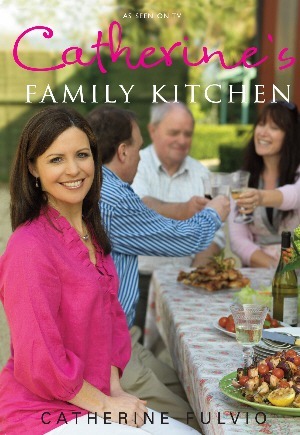 Catherine’s Family Kitchen is published by Gill & Macmillan. Catherine’s original recipe has more Indian flavours but, based on the recipe note, I took it on a Moroccan walkabout. Ras el hanout is an evocative Moroccan spice blend that it becoming more widely available – I picked mine up in a Middle Eastern shop in Dublin – or you can make it yourself. Chicken pieces – 800g, approx 8, skinned and cut in half. Red ale – 100ml. I used Sunburnt Irish Red or you could substitute white wine. Heat the oil in a deep, heavy-based pan over a medium heat. Brown the chicken pieces all over, set aside and add the sliced onion to the pan. Cook for about 8 minutes, until soft and slightly brown. Add the garlic and ras el hanout and cook for 2 more minutes. Pour in the red ale, simmer for 2 minutes, then tip in the rice, chickpeas, apricots and lemon zest along with the chicken. Pour over the stock, season and bring to the boil. Cover with a lid and reduce the heat until the whole pan is gently bubbling. This needs to cook for about 20-25 minutes or until the stock has been absorbed by the rice and the chicken is thoroughly cooked. Place the broccoli florets on top for the last 5 minutes so that they can steam cook. 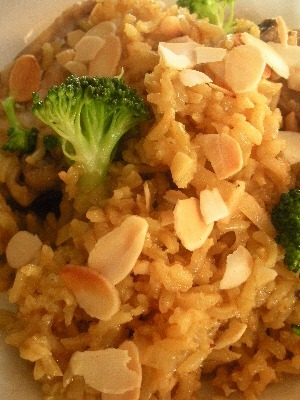 Sprinkle with the toasted almonds and serve. Adapted from Catherine’s Family Kitchen by Catherine Fulvio.